Plan your November, Boston! Start here. There are all sorts of amazing things happening in November this year. I just happen to be involved in one of them each weekend leading up to Thanksgiving. Are you looking to plan your activities and maybe get a jump on some handmade Christmas shopping? Look no further. Come enjoy all Roslindale has to offer with Roslindale Open Studios. Fall is Open Studios season in Boston and the good folks at ROS have been at this for 10 years now. There’s more than you can possibly imagine going on indoors and out on both days. Bring the kids, there are lots of things for them to do, and don’t miss out on Home Studio Bingo, the Harvest Fair, and more. Click on the link above for more details. 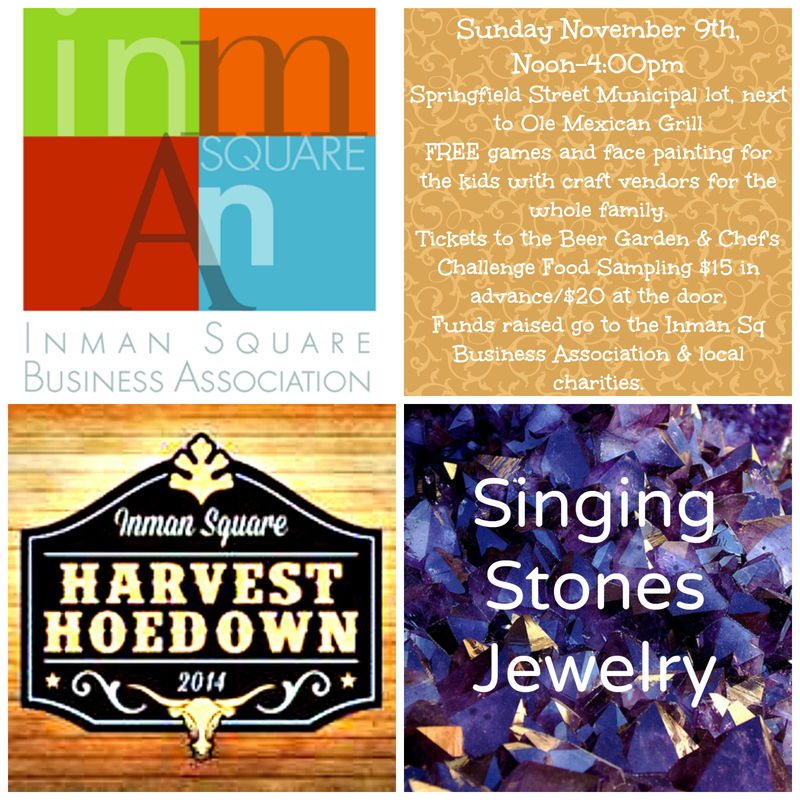 The 2nd annual Inman Square Business Association Harvest Hoedown is not to miss. From Noon-4:00pm the public parking lot next to Ole Restaurant on Springfield St, as well as a portion of Springfield St, will be closed to cars. There will be craft vendors, face painting and activities for kids, live music, and costume contests. Also, for those lucky enough to get tickets, $15 in advance/$20 at the door, there will be a Beer & Cider Garden and a Chef’s Challenge Tasting. Tickets and more information are here. Access to the fun, games, and crafts is FREE! Relax from the shopping and come hear the Seraphim Singers perform at the lovely and acoustically marvelous Mission Church. We’ll be presenting pieces written during and about the wars of the 20th century. If you’re not sure you like new music or think that it’s all experimental, electronic, or discordant let this concert show you otherwise. Discount admission for veterans and active duty military. Come and hear The Short 20th Century. Presenting a concert by the Arts Outreach Initiative between the Boston University School of Medicine and the College of Fine Arts. 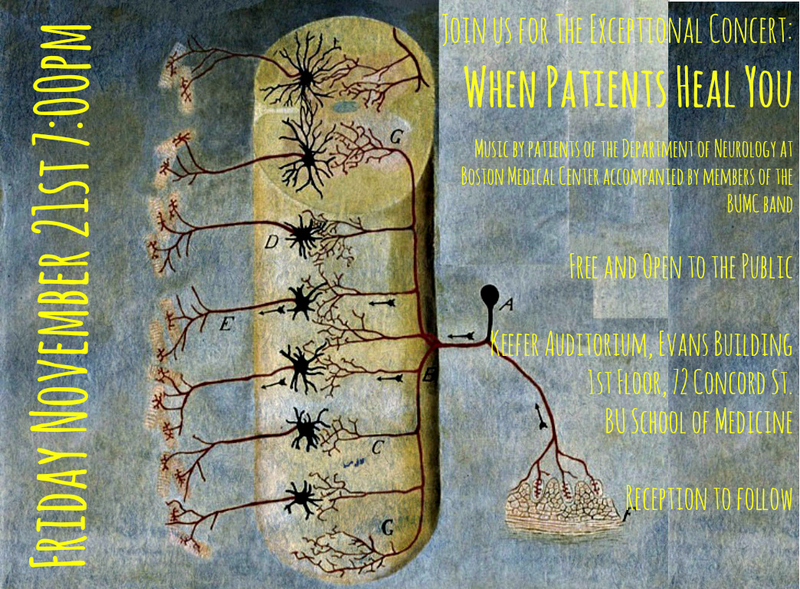 When Patients Heal You is a collaborative effort between the BU Neurology department within the Boston Medical Center and the AOI. All performers are patients, doctors, staff, and friends of the department who will step away from their respective roles for one night to make music together. We, yes we, I am one of them, will perform in a variety of musical styles across many eras and cultures. The concert is FREE and will be held in Keefer Auditorium, 1st floor of the Evans Building, 72 Concord St., BU Medical School. Details are here. And then, a weekend off before Thanksgiving! I hope to see you at these events as each of them is important to me in a different way. Previous Previous post: So much going on this past week. Oh, and Happy Halloween!